First Impressions Count, But How? Today we published a paper in PNAS about how people form first impressions based on everyday images of faces, of the kind you find on the internet. The four authors (L-R), Richard Vernon, Clare Sutherland, Andy Young and Tom Hartley – we also co-wrote this blog post. Underneath are reconstructions of photos of our faces which can be loosely thought of illustrating the way such images are “seen” by our model. 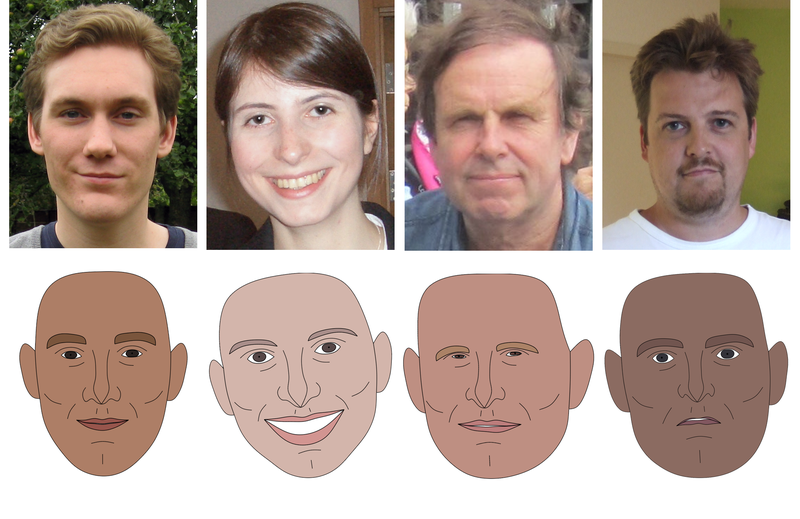 They are actually reconstructions based on the 65 numbers we used to describe each face, using a model trained on a large number of such images (but not these ones). Note the subtle differences in shape between the photos and the reconstructed image – the features we use do not (yet) capture some of the information in the images, but sufficient for the model to make accurate predictions about social impressions. These judgements are formed very quickly (in as little as a tenth of a second) and can influence our subsequent behaviour. The impressions we create through images of our faces (“avatars”/“selfies”) are increasingly important in a world where, more and more, we get to know one another online rather than in the flesh. So how can we go from an image of a face to a judgement about someone’s character? Author tomhartleyPosted on July 28, 2014 November 7, 2014 Categories ScienceTags faces, models6 Comments on First Impressions Count, But How?